Sorry for the long delay between updates in the news section-things have been extremely hectic for me. 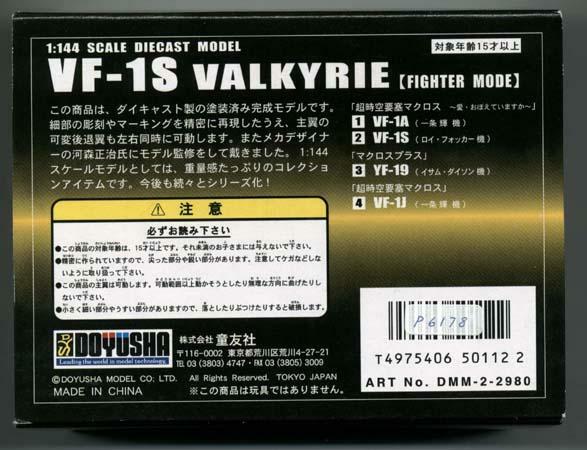 To get us back on schedule here is the just released Doyusha VF-1 review. 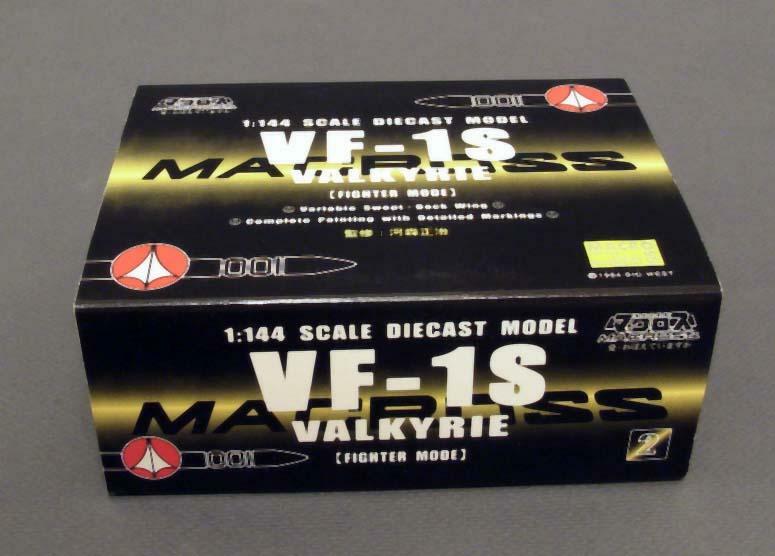 They're small, made of die-cast, non-transformable, heavy, not very detailed, come in beautiful boxes and are very expensive! What are they? 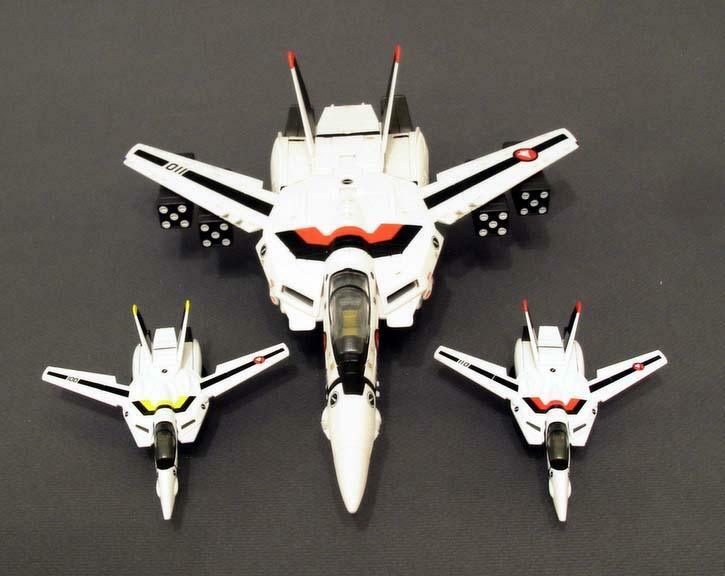 They are the new VF-1A and VF-1S fighter mode toys from Japanese company 'Doyusha', which is well known for it's die-cast military jets and airliner toys. 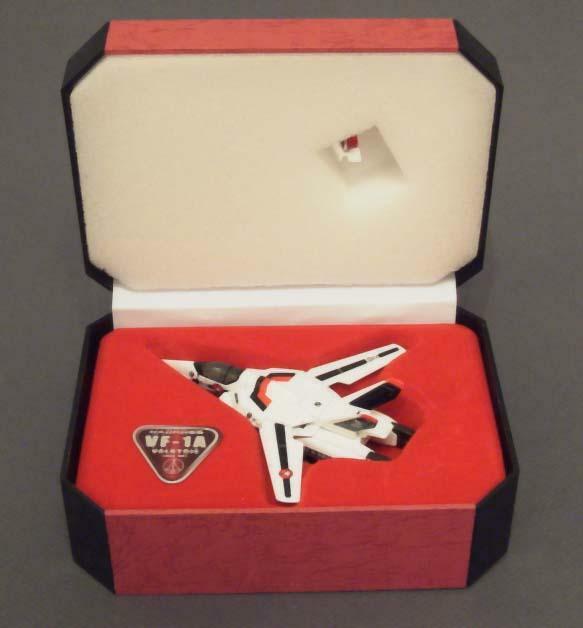 The Packing:- Let's start with the packing, which in my opinion is probably the classiest packing ever seen for a Macross toy. Each Doyusha comes in jewelry type box covered with an outer card slipcover. 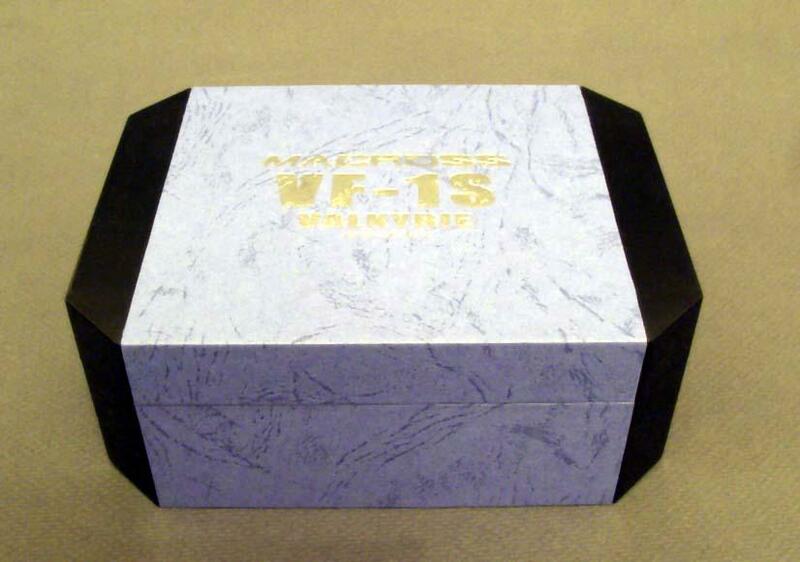 Overall box measurements are approximately 14.5cm x 6cm x 10.5cm (5 5/8" x 2 1/4" x 4 1/8"). The total box weight including the toy is 235g (8 1/4 oz). The outer slipcover has no picture of the toy, but is well designed and in my opinion pleasing to the eye. 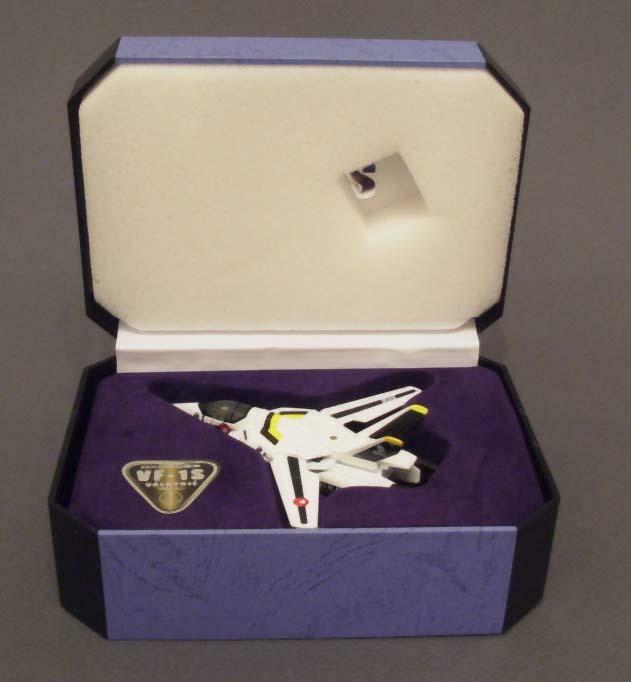 The slipcover features the Macross logo, UN Spacy logo and plane squadron number (001 for Roy Focker and 011 for Hikaru). 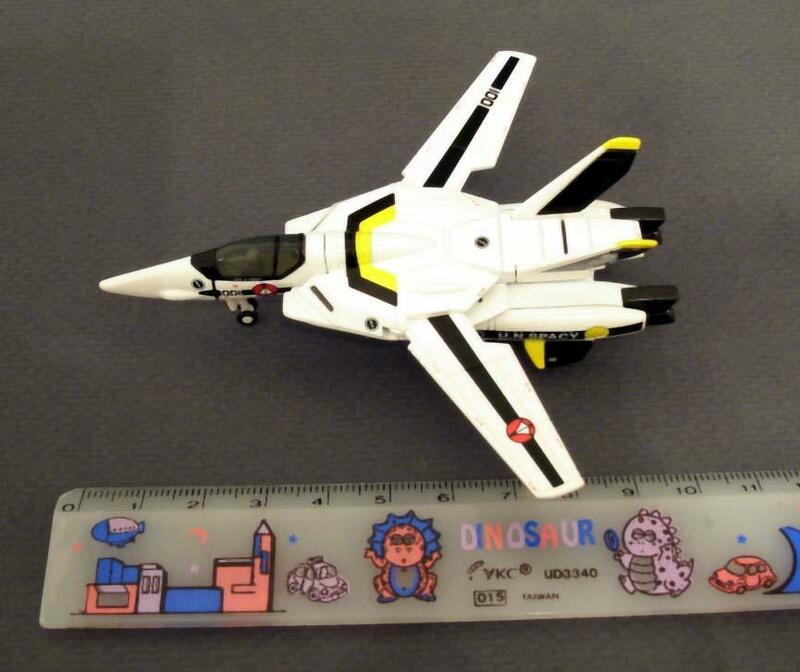 The back also reveals that the toys were manufactured in China, like most Macross toys these days. 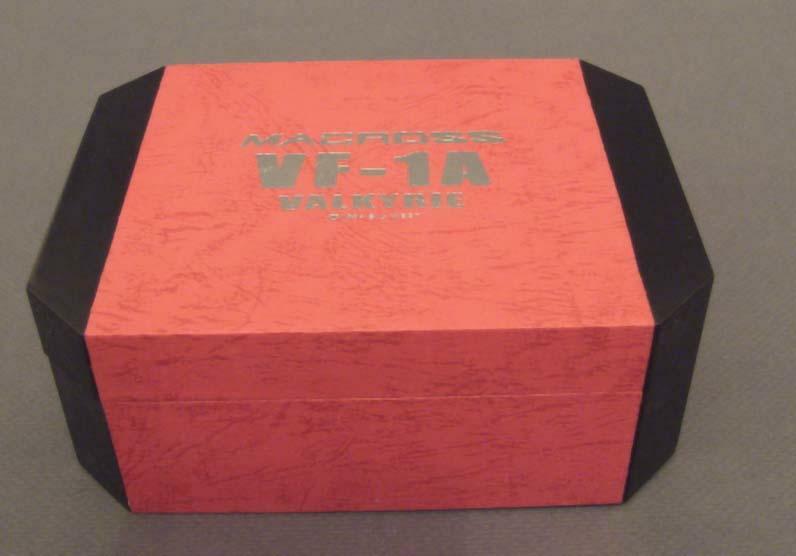 Sliding the box out of the slip-cover reveals an attractive blue and black box with gold lettering for the VF-1S, and a red and black box with silver lettering for the VF-1A . 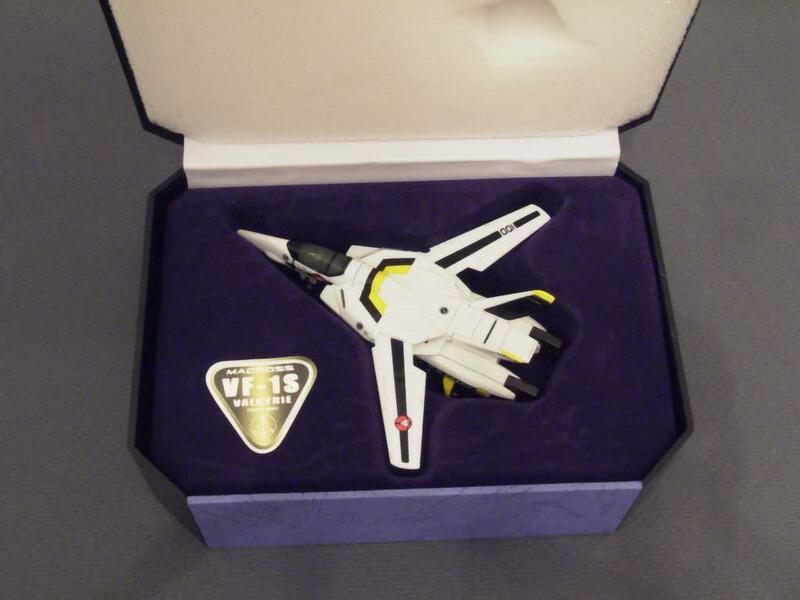 Toy Dimensions: - The Doyusha VF-1A and VF-1S measure 10cm (4") long and weigh about 70g (2 1/2 oz). 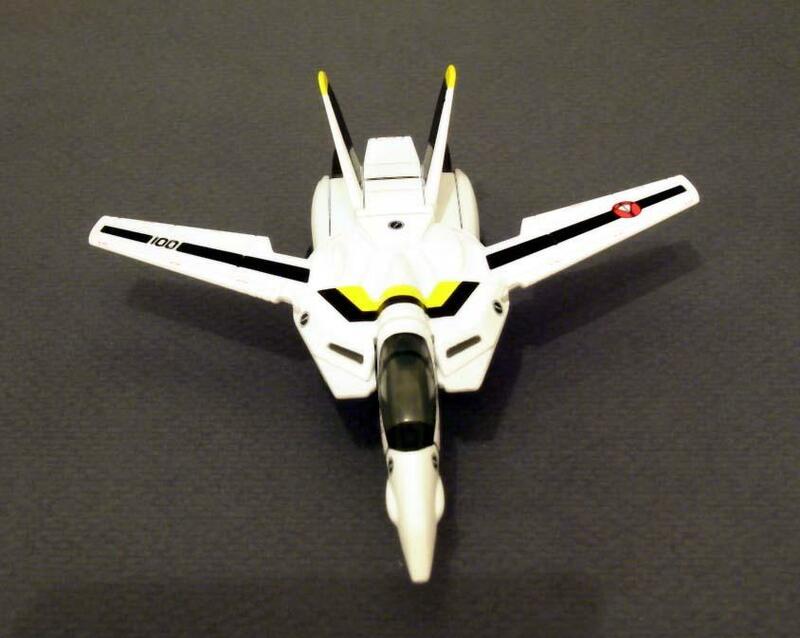 Moving/Removable Parts:- The only moving part on each toy is the variable sweep wings, which are geared to move together. The landing gear is fixed in the open position. 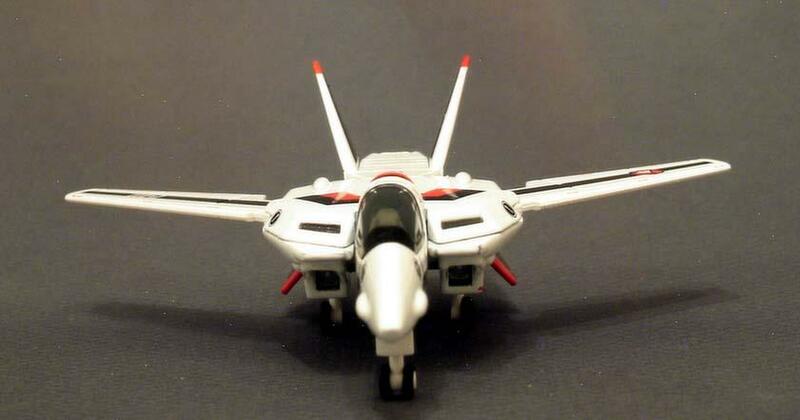 However, if you are one of those people who like to fly your toy around the house, there is some good news, the landing gear can easily be removed as it just plugs into holes on the underside of the plane. 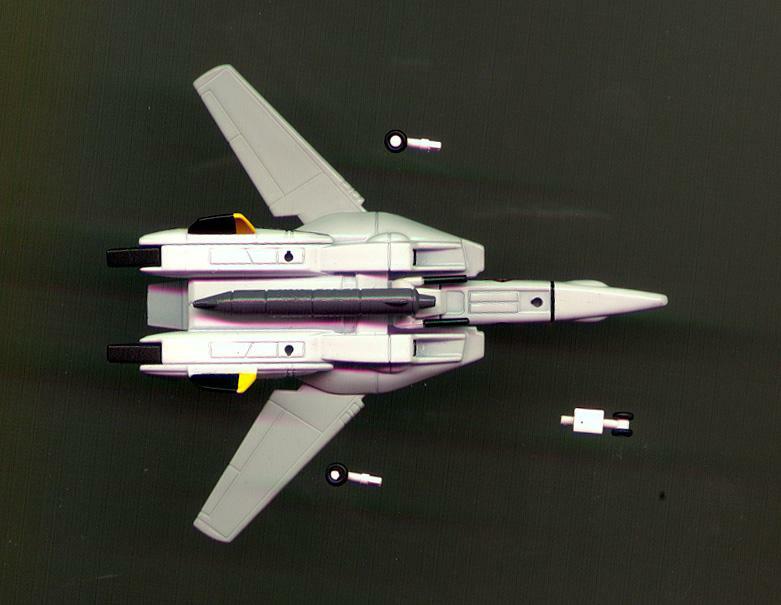 The gunpod is non-removable and appears to have been glued in place. Engraving Detail:- The engraving detailing on the Doyusha's is quite simple with only the most prominent panel lines actually being engraved, e.g. air brake, flaps, landing gear doors, dividing lines between chest and backplate and backpack, rudders and wing lights. However, this lack of engraved on detail is not surprising given the small size of the toy. * 'No Step' warnings printed on the wings and backpack. * 'Circle-Bar Verniers' printed in the correct positions. 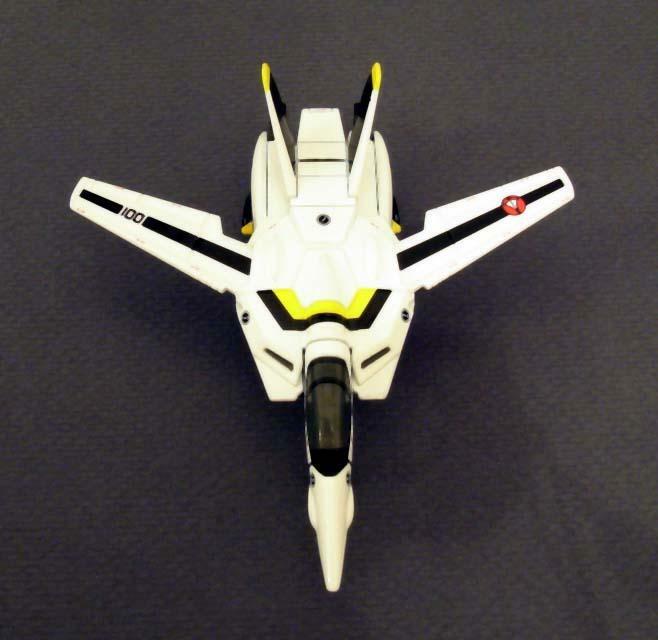 * 'Squadron Number', Skull Squadron emblem', & 'SDF-1' printed on the tails. * 'Pilot's name' printed on the canopy rail. * 'Squadron Number' printed on the lower leg fins. * 'Squadron Number', 'UN Spacy Logo' printed on the wings and nose. * Red '>' Shape printed on side of engine intakes. * Red 'Warning Triangle' printed below canopy. 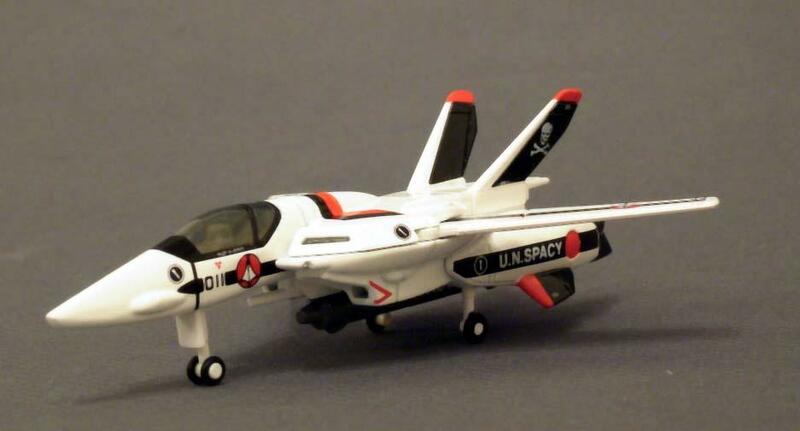 * 'UN SPACY' printed on lower legs and gunpod. Paint Job:- The paint job on the Doyusha's is quite good, but perhaps the paint is a little thick. 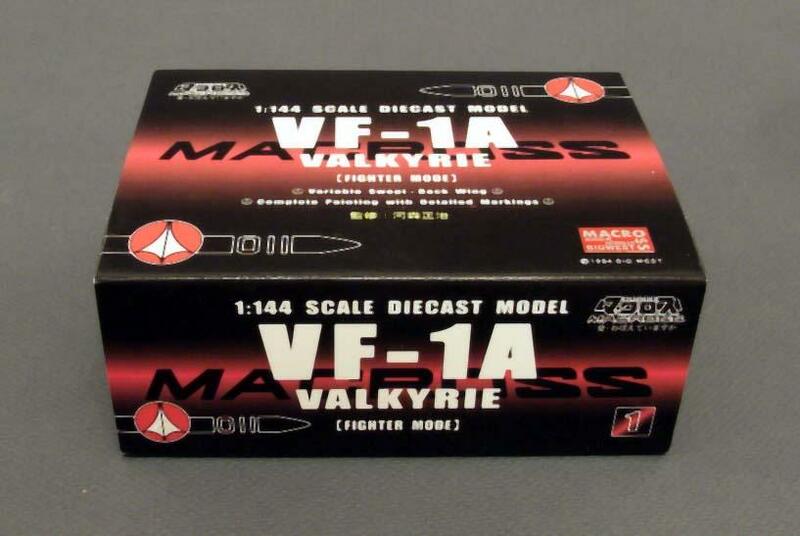 My VF-1S is without any noticeable paint flaws. 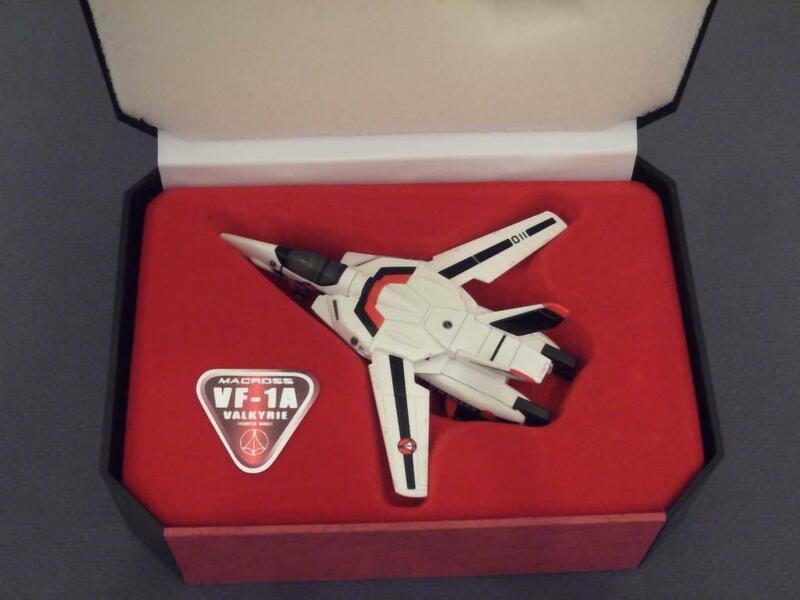 However, my VF-1A had a small spot of paint missing on the part that divides the main intake and the chest plate. On the VF-1A, I also noticed a couple of places where dust or small hairs had become trapped in the paint during spraying. 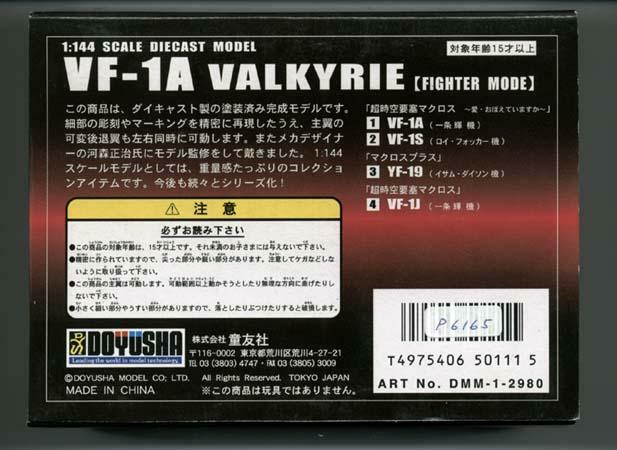 Sculpt:- I'm quite impressed with Doyusha's sculpt of the VF-1, but there are a couple of places where I felt they didn't quite get it right. 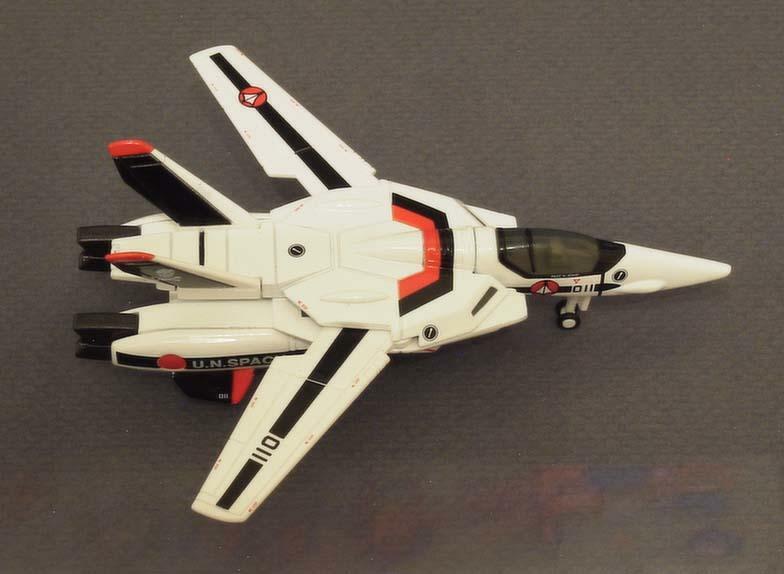 Firstly, I don't like the sculpt of the canopy, especially the bottom edge of the canopy. Something about it just doesn't look right to me. 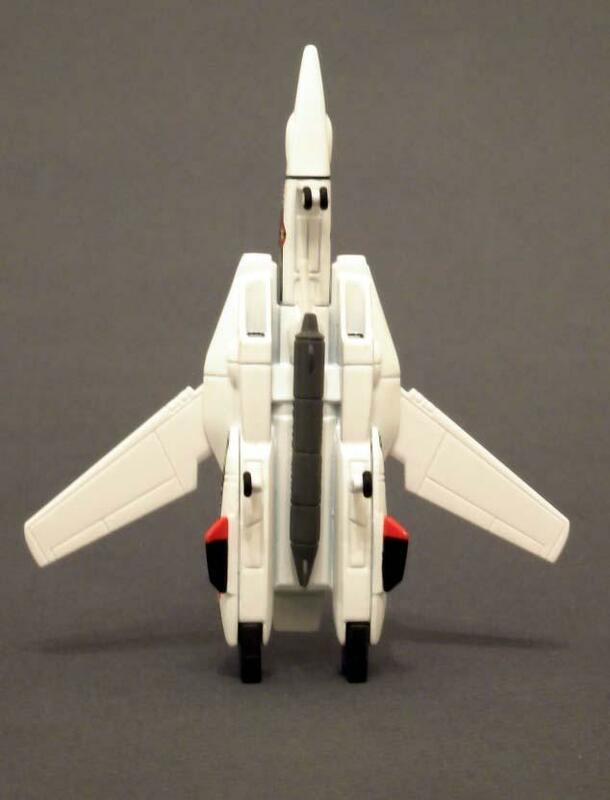 Secondly, when viewed from the side, the tail fins are too narrow. 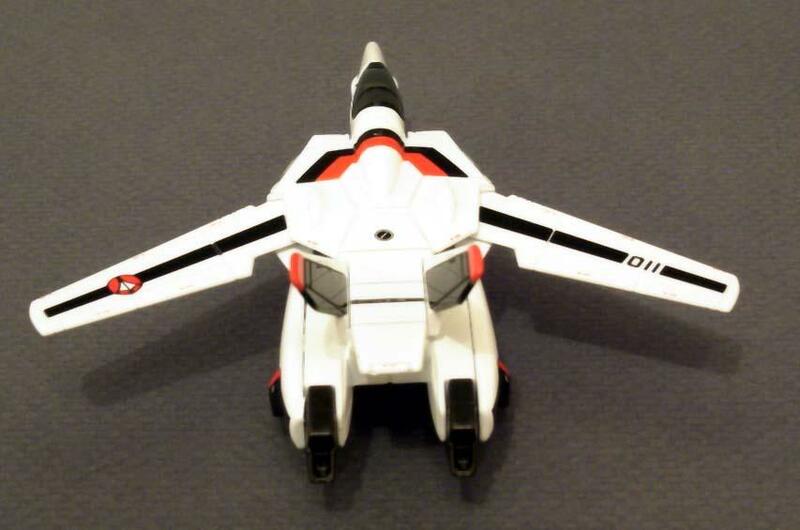 I am quite impressed though that Doyusha has sculpted the toy with intakes open to show the turbine blades! 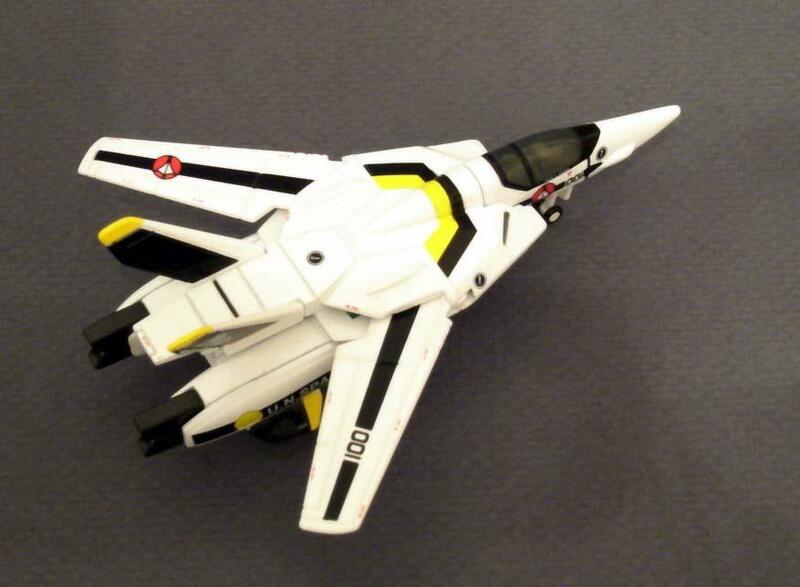 Compared with Doyusha's military jet line, Doyusha has certainly improved their sculpting ability for the VF-1. Conclusion:- So is it worth it? Well, in conclusion I would say no, not for that price. I like the sculpt, I'm quite impressed by the level of detailing and the packaging is fantastic, but frankly the toy is only worth about half what I paid for it. 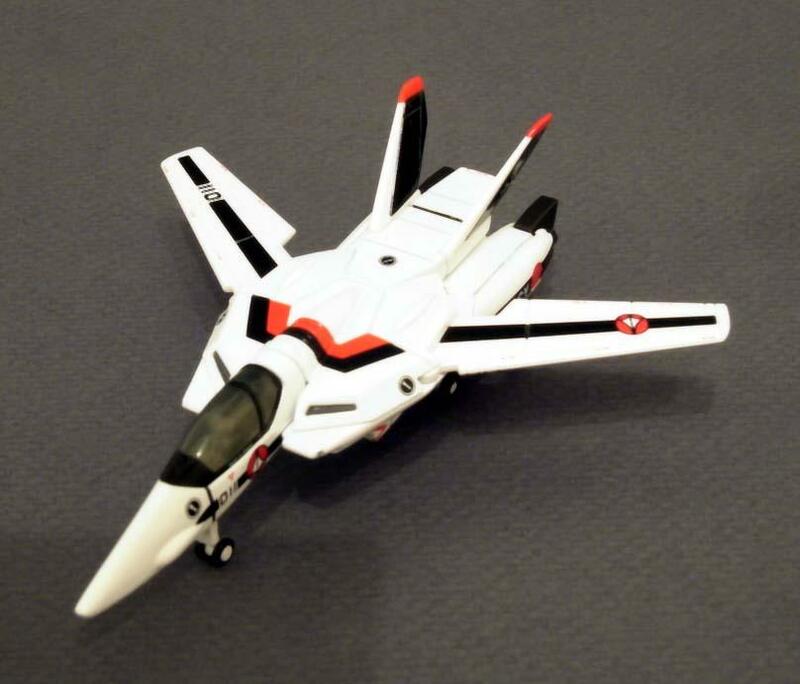 I'd give Doyusha a mark of 6.5 out of 10 for the design of the toy, but only 3 out of ten for value for money.